Home → Recycling → Everything you need to know about recycling computers and rare earth elements. Every now and then we think it’s important for our audience to know more about our principles and reasons for being part of the e-cycling community. 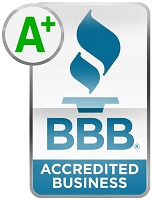 Yes, selling back your laptops and iPhones is obviously part of our business, but it’s more than just that. We truly believe in the byproduct of which we maintain; a cleaner, healthier environment for everyone. We are in this together as a global population. We have covered it before but, it is a well known fact that collectively we need to conserve our resources and our landfills of heavy metals and dispose of them properly. Many do not know that the plastics in most electronic devices have a fire retardant property to them, and that means that the plastic needs to be cut down and sold to those types of companies that recycle and melt down those plastics to use again in new products. Everyone is aware that a new, and more modern, global society is probably only a decade or so away with long term battery usage in cars and homes, and with this new epoch, we need to stay abreast with the growing needs of natural resources. 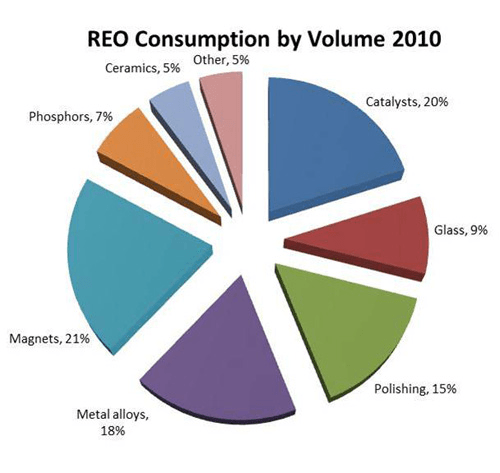 With the growing needs of rare earth elements (REM) and components, when done properly, it is much more cost effective and easier on the environment to recycle electronic goods to obtain them. 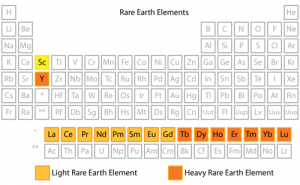 What exactly are rare earth materials? Well, they are any of a group of chemically similar metallic elements comprising the lanthanide series and (usually) scandium and yttrium; however despite their name, rare earth elements are not so rare per se, they encompass about 28% of the earth’s mass. The word “rare” in this instance equates to the archaic usage of rare when it meant “difficult”. 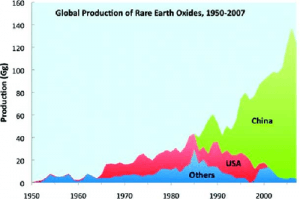 Rare earth elements make up a lot of the earth’s crust, but they are generally found in the same conglomerations, this situation makes it expensive and more difficult to separate, so being able to refine them from recycled components makes more and more sense. In Japan there is an estimated 300,000 tons of rare earths stored in unused electronics waiting to be recycled. Many rare earth materials can be found in batteries and with the advancement in car batteries it is absolutely necessary that we recycle as many electronics as possible. In the days forthcoming it will not be inconceivable that our cars and homes will function solely on battery power. That power is going to be harnessed from solar panels but the batteries themselves are chock-full of rare earth material. The US used to be that planet’s largest exporter of rare earth material, but a while ago China took over that title and have been the leading exporter of REM. Not only do they have the mega mines that it’s mined from, but as discussed in a previous article about recycling electronics , much of the material comes from the components that the US sends as recyclables to China for processing. As seen in New York, the days are quickly approaching when states are going to begin imposing fines on people and companies that are not e-cycling their old TVs, computers, laptops, smartphones and the like. Don’t get caught behind the eight ball and jump on the gravy train while the gettin’ is good; sell back your laptops and electronics today, and do the Earth a solid.